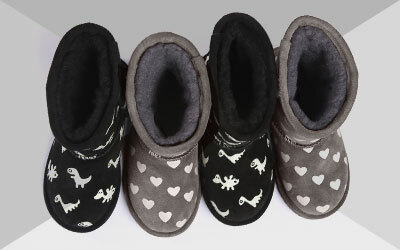 The Amity Kids is EMU Australia's soft, warm and comfortable, classic, children’s moccasin slipper. Made with soft suede and lined with Australian Merino wool these deliver on everyday luxury. Featuring vintage leather lace details and a hand stitched moccasin toe for a traditional look, these slippers can be worn in or out. Inspired by the classic moccasin, the Children’s Amity Kids slipper has been treated to EMU Australia's comfort and luxury. Supple, natural suede is lined with thick Australian Merino wool for an indulgent fit that keeps young feet warm and comfortable. A flexible rubber outsole provides support and traction indoor and outdoor and the vintage leather lace and hand stitched toe details complete the classic look.